Performed by: Sabine Liebner (piano). Featured works: Home Burial, Folio, Twenty-five Pages, Four Systems, Summer Suite '95. "Brown explained his compositional process by saying, 'mobility of the sound elements within the work and the graphic provocation of an intense collaboration throughout the composer-notation-performance process - were for me the most fascinating new possibility for 'sound objects' as they had been for sculpture and painting.' 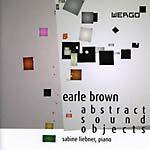 On this disc, Sabine Liebner performs important works for piano by Earle Brown. Of special note is the world première of the recently discovered Home Burial, written in 1949 and based on a poem by the poet Robert Frost." This long-awaited reissue of the CRI recording of Earle Brown's (1926-2002) music is the best overview of his seminal early works. "It is obviously a great pleasure for me that CRI is re-releasing its 1974 recording of my work, and an even greater pleasure that I am able to add to the repertoire. The performance of 'Times Five' and 'Novara' (recorded in Holland) still seem very fine representations of the works and are performed brilliantly by the Dutch musicians. December 1952 as realized by the late, brilliant pianist and composer David Tudor is, in my opinion, the best of many performances he made of this graphic score. It is fascinating to hear the realizations by Michael Daugherty of November 1952, December 1952 and 'Four Systems' (all published in 'Folio' (1952-54) -- immensely inventive and marvelously performed on piano, tape and computer, with the newer technology that was not available to Tudor at the time he recorded his version in December 1952. This recording of 'Nine Rare Bits' is one of six versions that Antoinette Vischer (who commissioned the work) and George Gruntz surprised me with when I returned to Basel after my lectures in Stockholm in 1965. Although I very specifically compose the sound events, it is an 'open-form' score, subject to innumerable formal shapes, arranged by the performers themselves. 'Music for Violin, Cello and Piano' is a very early (1952) twelve-tone serial piece in very strictly metric notation. It uses Schillinger-suggested 'serial' techniques, very similar to Messiaen, as it turned out. In contrast, 'Music for Cello and Piano' is a completely subjectively composed work, in what I called 'time notation' (contrary to metric) which is now referred to as 'Proportional Notation'." Recorded 1999-2002. A collection of early works by Brown, written 1952-64. Includes: "Folio", "Corroboree" (for three pianos); "Four Systems" (multi-timbral realisation); "Tracking Pierrot" (for ensemble). Performed by the Dal Niente projects: Simon Allen (vibraphone, marimba, percussion harmonicas, various sound-producing media); Peter Bevan (trombone); Bridget Carey (viola); Tania Chen (piano); Robert Coleridge (piano); Francesca Hanley (flute); Nicolas Hodges (piano); Mieko Kanno (violin); Lore Lixenburg (voice); Zoe Martlew (cello); Mannon Morris (harp); Fiona Ritchie (vibraphone,marimba); David Ryan (clarinet, bass clarinet); Nancy Ruffer (flute); Andrew Sparling (clarinet, bass clarinet); John Tilbury (piano); Earle Brown (conductor).